In 1866 James C. Clinch lived in a brownstone home at No. 124 East 19th Street. The block was lined with similar houses, all home to respectable merchant-class families. But only a few decades later the house would be gone, replaced by a quaint, one-story carriage house. The last quarter of the 19th century saw a revival of interest in the city’s Dutch roots and the little stable reflected that with a brick, stepped gable. Although the builder was financially comfortable enough to afford his own carriage house, he did not waste money on unnecessary architectural embellishment. The shallow, dentil molded cornice—the sole decoration other than the amusing gable—was created in brick. With the turn of the century came the automobile and car dealer R. Bertelli & Co. took over the little building as its headquarters. 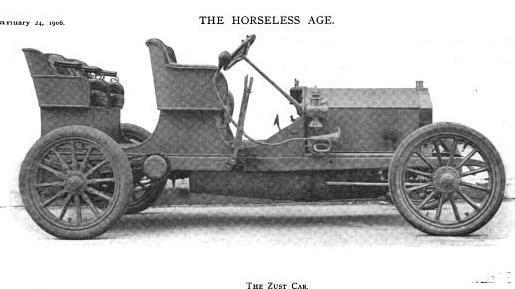 On New Years Eve 1905 the firm announced a coup—it would be the sole agent for the Italian automobile known as the Zust, named after its maker Robert Zust. Bertelli would introduce the high-end car at the 69th Regiment Armory automobile show in the spring. “Sheriff Bob” was Robert Chanler, whom Current Opinion called “America’s most imaginative decorator.” (The nickname was a reminder of his one term as Sheriff of Duchess County.) The artist’s mural panels decorated residences like that of William K. Vanderbilt; but they were in no way traditional. The Chanlers bought three lots at Nos. 141, 143 and 145 East 19th Street. Chanler also purchased the little building where Italian automobiles had recently been displayed. To the rear the artist established a glass-roofed studio and it would appear he renovated the front portion into a residence. In 1915 Fred J. Fox, a member of the New York Pathological Society, listed the address as his home. The artist’s exotic works often included lush jungle themes or Asian-based motifs. Animals played a large part in his art. The Edison Monthly noted in 1915 “Some time since, when the artist, Robert W. Chanler, took up the principles of Japanese design, the question of models and idea-promotors [sic] at once presented itself. Leaf and bird forms, alive and flourishing, were soon imported and housed in a cosy [sic] garden at the rear of the hallway” at No. 124 East 19th Street. To provide live models for “the sinuous fish forms that glide in and out of most well-regulated Nipponese conceptions,” Chanler constructed a large fish tank. But there was the problem of heating in an age before hobbyists made fish tank maintenance commonplace. “Then came cold weather with cold water, and a melancholy company of goldfish found themselves far from home with the mercury falling,” said The Edison Monthly. 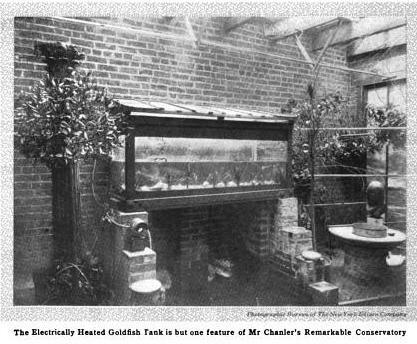 Chanler turned to the Edison firm which contrived a fish tank heater and a tank cover with electric light bulbs—it was the prototype for generations of fish tanks in living rooms and dens to come. The tiny house became home to Charles Shepard Bryan, his wife Annie and their three children in 1920. Bryan was a broker and manufacturer, the son of Civil War soldier Major Augustus Bryan and had himself served as a Lieutenant Colonel in the Officers’ Reserve Corps. Perhaps the house was too confining for a family of four and a year later the newlyweds Mark Coats Cadwell and his bride, the former Marion Virginia Brown, moved in after their honeymoon. They would soon leave their love nest for New Jersey, however, and Dwight F. Norton would take up residency with his wife, Jessie and their son, Henry. Norton was an engineer with the American Telephone & Telegraph Company. Another one I'd been curious about. Thanks. This has always been my favorite building in the city. Thank you so much for exploring the history for us! Glad you enjoyed the post and hopefully found out some new information on these great little building. Hi..In the 1930s, this house belonged to the father of an artist I am researching. Carol Janeway's father was Charles Cecil Rindsfoos from Circleville Ohio and graduated as a civil engineer from Cornell, ca 1906. He worked on the design of the caissons for the Woolworth Building and married an Brooklyn Assemblyman's daughter, Carol Schroter Bacon, a Vassar graduate. 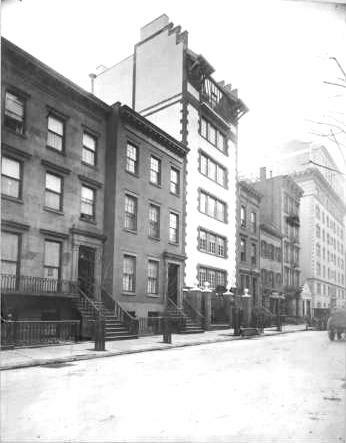 In the 1920s Cecil got involved in New York City real estate and appears to have acquired 124 e 19th before he moved back to Ohio to be a banker with his brother. It served as a Rindsfoos family pied a terre and when the daughter, the former Caroline Rindsfoos, returned to NYC from UK in 1939, she managed to lived there and started her tile decorating business in this little house. Her name was Carol Janeway (1913-1989) and you can see that tile-decorated fireplace of 124 E 19th somehow influenced her specialty: decorated tile fireplace surrounds. I am sure that C.S.Rindsfoos sold the house in the early 1940s...surely it is a matter of public record.